Spend your special night in one of our beautiful rooms or suites. You will be greeted by a beautiful bouquet of roses (or other flowers at your request—perhaps something to reflect your wedding flowers?) Relax in an old-fashioned clawfoot tub or double jetted spa tub (depending on which room you choose)…..bubble bath will be provided, of course! Then relax with a bottle of Champagne and either chocolate covered strawberries or a plate of cheese and crackers with fruit, while you watch a romantic movie on one of our many available movie channels. The next morning, awake to the aromas of fresh coffee and the gourmet breakfast being prepared for you by your innkeepers. After breakfast, a special surprise for you: a souvenir keepsake of your visit to the Wayside Inn, two handcrafted Wayside Inn Coffee Mugs are yours to keep! Call us at 410-461-4636 to book this romantic getaway. Additional amenities to enhance your stay! Ask us about anything else you would like to enhance your stay…We will try our best to make it happen! Want to add this package to your stay? 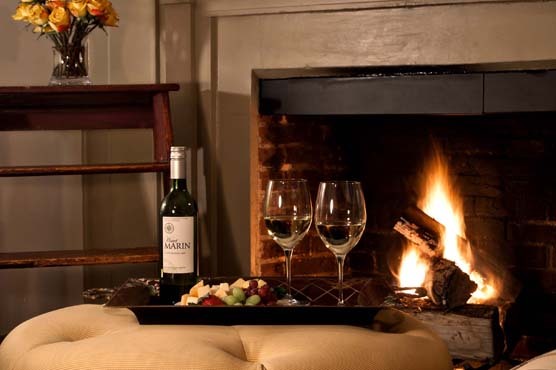 Please call us at 410-461-4636 to plan your romantic getaway!